Haunted houses and horror theme parks rely on a visceral formula of scares and laughter. They deliver an experience that alternates between frights, supplied by actors in rubber masks who grab you and carry chainsaws with no chain, and then they diffuse those scares in a safe funhouse situation (having a group of friends or possibly a mind-altering substance to cut the tension helps, too). But it’s the knowledge that visitors are, ultimately, safe from harm that makes such places fun. We can laugh after each scare because our knee-jerk reaction is unfounded. We are, after all, unscathed. As early as Tobe Hooper’s The Funhouse (1981), horror movies have explored the idea of a haunted-house-gone-wrong, where visitors expecting cheap thrills realize that their screampark of choice isn’t kidding around. Later, Rob Zombie’s House of 1000 Corpses (2003) featured a family of killers operating a freaky roadside attraction, and The Houses October Built (2014) followed masked murders terrorizing a group of friends from one underground haunted house to the next. 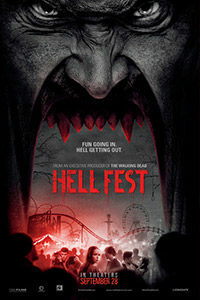 In a similar vein, Hell Fest puts a group of twentysomethings into a horror theme park with a masked slasher bent on killing them one by one. At first, they think its part of the show; but then, gradually, they realize it’s not. And when they try to tell one of the carnival’s security guard, they get a response like, “Yeah, that’s their job.” The characters are stock types, though their performers give them personality. Just home from a busy college schedule, Natalie (Amy Forsyth), a somewhat shy and self-serious type, visits with her wilder best friend Brooke (Reign Edwards), as well as Brooke’s out-there roommate, Taylor (Bex Taylor-Klaus). Brooke and Taylor have boyfriends, Quinn (Christian James) and Asher (Matt Mercurio), respectively, but Natalie has been too busy for dating. Fortunately, the clumsy but amiable Gavin (Roby Attal), her longtime crush, has purchased them all tickets to a traveling horror carnival—giving Brooke and Quinn a place to make out, Taylor and Asher an opportunity to explore their horror fandom, while Taylor and Gavin flirt, awkwardly. Unlike most slasher movies, Hell Fest doesn’t populate its 89-minute runtime with abrasive, awful young people, the fates of which the audience couldn’t care less about. This has been a problem with most horror fare of this type, going back to the original Halloween (1978), Friday the 13th (1980), A Nightmare on Elm Street (1983), and the recent Scream sequels—movies that do not engage the viewer with their often stupid, selfish, and impetuous characters, thus making the masked killer the hero or star of the show. Not caring much about the victims removes the empathy from the screening and, like a haunted theme park, turns the experience into one of joyful scares—pangs of fright followed by relieving laughter. But Hell Fest offers up six characters that could hardly be more than two-dimensional; and yet, they’re a congenial bunch that doesn’t deserve what’s coming, even by slasher logic. And so, when a guy in a hoodie and a weird mask appears in the eponymous park and begins to stalk our group of friends, we worry. They’re all nice enough, and none of them are asking for it. The killer, as seen in the prologue, has an affinity for cutting up victims and leaving them to rot in horror carnivals for days before anyone notices. As Natalie and friends brave the theme park, they’re stalked by the masked killer, whom they assume is a performer. They encounter actors in monster costumes, weird bag-headed children who lead them to the next ride, and a twisted host (horror veteran Tony Todd). They take haunted maze tours with fake skeletons, spider webs, and animatronic evil clowns. Some of it’s laughable; other times, a little spooky. But it’s only after some considerable time has passed when director Gregory Plotkin delivers unflinching violence, killing off perhaps the nicest of the characters first in a brutal and shocking display. Now things are serious, and we sit up in our seats. Though it’s written by a team of six credited to the screenplay and story, Hell Fest has none of the mangled storytelling or character inconsistencies found in so many scripts penned by a lot of writers. The movie proceeds without a winking pretense. The music by Bear McCreary does a fine job of not telegraphing our emotional involvement, and the cinematography by Jose David Montero adjusts for the night and the blood-colored gels throughout the park. Plotkin avoids flashy camerawork or overly expressive blocking, allowing the viewer to sink into the otherwise thin story of survival. The body count doesn’t start to build for a while, until more than halfway through the movie, and by that point, we’ve spent enough time with Natalie and her friends, and even watched one or two of them die in a bloody scene, to feel scared for them. Perhaps the best thing about Hell Fest is the ending, which won’t be spoiled here, at least not in detail. The final moment reveals something about the killer that has sinister implications. He’s not the personification of evil or an invulnerable force back from the dead. He’s something eerier than your typical movie maniac—he’s an average American. Moreover, the movie remains satisfying because it’s not trying to approach the slasher genre from a place of irony or nostalgia, as many have in recent years. 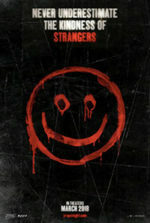 Similar to this year’s superior The Strangers: Prey at Night, the experience is content with providing a straightforward, almost classically-minded horror show. 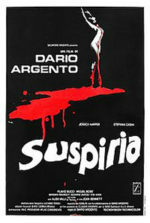 Its female-led cast is terrific, particularly Forsyth in the lead, and its creep factor is high. Fans of horror will enjoy Hell Fest, realizing how rare it is in today’s hypertextual world to pull off a work of straightforward horror without a kitschy, post-modern angle.